The event will include a tour of Broadcast Solutions’ headquarters as well as hands-on demonstrations of products from all major brands. 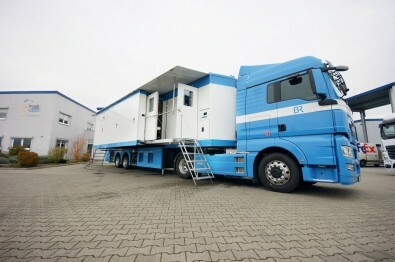 As part of its recurring Broadcast Innovation Days series, systems integrator Broadcast Solutions GmbH will host a one-day event on December 9, 2015 at its headquarters in Bingen, Germany to show off a variety of new live production technologies it is installing inside a new fleet of OB Vans for customers in Europe. Participants to the Broadcast Innovation Day in Bingen must register here. The event will include a tour of Broadcast Solutions’ headquarters as well as hands-on demonstrations of products from all major brands from the broadcast industry. This includes Aviwest, Axon, BMS, DVS, Ericsson, EVS, Genelec, Grass Valley, Hitachi, Ikegami, Imagine Communications, Lawo, L-S-B, Movicom, ProSat Solutions, Riedel, Robycam, SAM, Sennheiser, Serenity, SH BP, slomo.tv, Sony, Studer and Yamaha. At the event, Broadcast Solutions will present several large OB Vans being constructed in their production hall in Bingen, Germany. As part of a 4K/UHD arena, camera manufacturers, monitor producers and additional participating manufacturers can show their approaches to how to process 4K content. Professional lighting will also be discussed. At the event, Broadcast Solutions will present several large OB Vans in their production hall: a Streamline S8 4K OB Van, a Streamline S12 OB Van, a 16 Cam OB Van, a 30 Cam OB Van, a Hyperflex Study-Car plus several SNGs.